Know someone who needs some inspiration to ride? Trek just launched the monthly Trek Women Email series, with a focus on encouraging women to pedal – whether they’re already on two wheels, or just thinking about it. The inaugural email has an inspirational story about a young triathlete, a tech tip from the Trek Women Demo team and a chance to win a WSD saddle. Forward this email and encourage her to sign up. Maybe it’ll spark an increased interest in cycling, and she’ll join you on the trails or road more often. 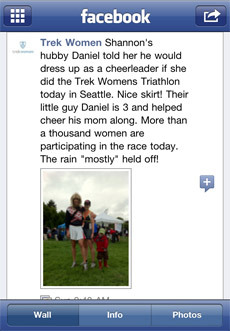 Know a woman who likes to “share and share alike?” Thousands of women have joined the conversation on the Trek Women Facebook page, sharing inspirational and sometimes unusual stories, like the guy who told his wife he’d dress up as a cheerleader if she trained for and completed the Trek Women Triathlon in Seattle. She crossed the line with a wide grin, and he was quite fetching in a blonde wig and flared skirt. Now that’s love. Visit your local Trek retailer for women’s cycling products and info on local cycling events such as Ladies’ Night Out, the Breast Cancer Awareness Ride, or the Women’s Demo Tour. Update your preferences for Trek Bicycle emails. Unsubscribe from future Trek Bicycle email updates. Copyright&nbsp;©2010 Trek Bicycle Corporation. All Rights Reserved. This e-mail was sent to: email design. To share this message with a friend, click here.